Beaver Dam is the most remote state park in Nevada, located in an uninhabited, hilly region in the far east, adjoining part of the Dixie National Forest in Utah. 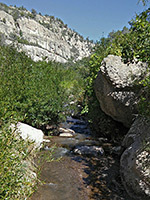 The preserve extends four miles along the deep, wooded canyon of Beaver Dam Wash, and includes the lower end of the narrower, more steep-sided tributary of Pine Park Canyon. The main drainage used to contain a small reservoir, created by the construction of an earthen dam in 1961, though following flood damage this was removed in 2009, yet the name persists. The park, which is reached only by a 27 mile drive along a gravel track, sees very few visitors and may be completely empty on some days. People come here for the tranquility and for the peaceful, undeveloped surroundings; camping and fishing (for rainbow trout) are the main activities, plus hiking along four short trails. 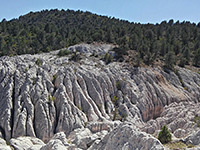 Other features include small waterfalls along Beaver Dam Wash and its tributaries, several warm springs, extensive outcrops of volcanic rocks (principally white tuff and reddish-pink rhyolite), and the remains of a pioneer settlement, Hamblin Ranch. Access to the state park is along the unpaved Beaver Dam Road, which leaves US 93 about half way between Caliente and Panaca, and heads east, climbing gradually over plains and low hills before entering a shallow valley, which provides a course for the Union Pacific Railway. 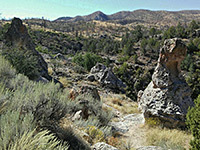 On the far side of the valley, the road continues a short distance to the rim of the deep, wide canyon of Beaver Dam wash and descends to the park entrance, where the surface becomes more uneven. A short side track goes north to the site of Hamblin Ranch, though not much remains after the main structure collapsed a few years ago. 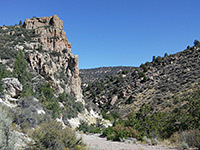 All other facilities are south, along the canyon floor; these include a ranger station, three campgrounds, four trailheads and several day use areas. Drinking water is available between April and November. The site of the former Schroeder Lake, the reservoir, is in the middle of the park, east of campground B, but the dam is completely removed and the valley floor upstream has returned to its natural state. The west side of the valley is quite gently sloping but the east side is much steeper, especially so around the conference with the major tributary of Pine Park Canyon, though this area, towards the north of the park, is not accessed by any trail. 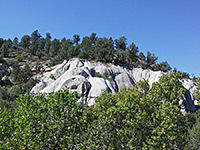 The shortest of the park's four hiking paths is the Oak Knoll Trail (0.3 miles); this rounds the end of a ridge and drops down to the bushy corridor surrounding Beaver Dam Wash. 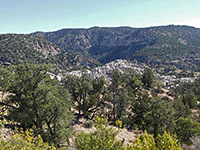 The 0.8 mile Interpretive Trail (also known as the Overlook Trail) ascends a minor hill east of campground B for the best overall views of the canyon, and is accompanied by notices about the local history and plant life. 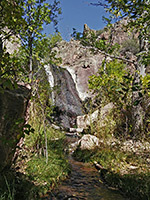 The 1.2 mile Waterfall Trail, starting at the south end of the park road, follows another major tributary, Sheep Canyon, past some warm springs, up to a small fall, very close to the Utah stateline. 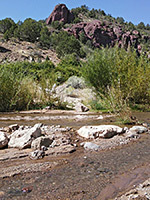 The longest hiking route is the Beaver Dam Wash Trail (2.2 miles), which explores a scenic section of the canyon floor, crossing the shallow stream several times.